This page had 281939 visitors. Estimation based value of real estates. 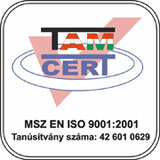 Budapest Bank qualifies its partners every quarter of the year and we regularly achieve the best results. Valuation of properties qualified as soil or non-soil, real estate expertise. Valuation of real estate for the expansion of branch office. Valuation of properties qualified as soil or non-soil (mainly based on real estate offered for EU tenders, for example Budapest Chemical Works).